General Description: ​Zims Hot Springs​​ is a commercial family destination hot spring resort located along the Little Salmon River with views of the Payette National Forest in Adams County, Idaho. Zims boasts an outdoor hot springs pool and a hot springs soaking pool. This geothermal resort offers accommodations that include RV and tent camping with a snack bar for dining. Location: From Boise, Idaho is 120 miles or about 2 and half hours to drive to the hot springs. Accessibility: ​Zims Hot Springs​​ ​​is very accessible. You can drive up to the property. The hot springs are a short and easy walk from the property. This hot springs has limited handicap accessibility. Hot Springs: ​​Zims Hot Springs​ ​boasts boasts an outdoor hot springs pool and a hot springs soaking pool. The outdoor soaking pool has a temperature from of 103 - 106 degrees. The outdoor hot springs swimming pool has a temperature between 90 - 100 degrees. The mineral water is treated with chlorine. Clothing is not optional. Bring your bathing suit. 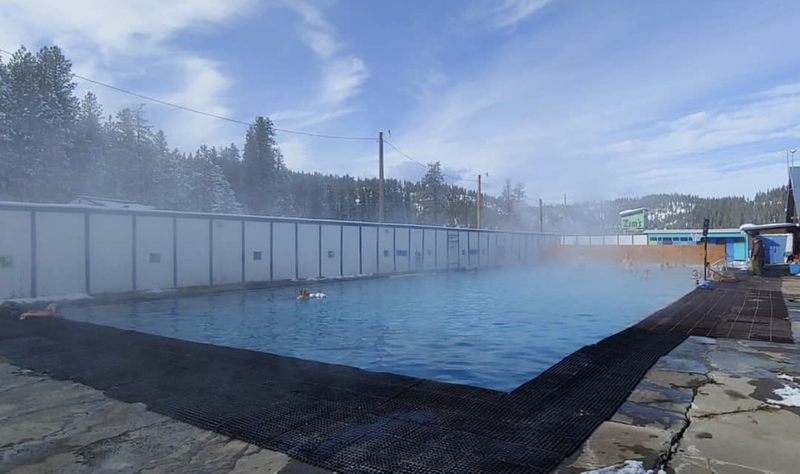 Hot Spring Tips: ​​Zims Hot Springs​ offers day use for non guests. Soaking access is included for guests with accommodations. This hot springs is pet friendly. Dogs need to be leashed and are only allowed in the campsite area. Zims has a snack bar for dining. The resort has lockers, changing rooms, showers and bathrooms. Clothing is not optional. Bring your bathing suit. Youtube Video on Zims Hot Springs is below.